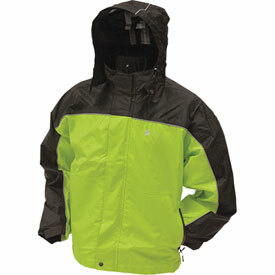 Made of a hybrid fabric called ToadSkinz™, delivering the look and feel of a traditional polyester rain jacket with their trademark windproof, waterproof, breathable, microporous DriPore® film and a non-woven inner liner. Fully sealed and taped waterproof seams. Dual storm flap and rain gutter with snap front closure. Exclusive Frogg Eyzz™ reflective piping and 2 in. Toad Strip on back panel. Adjustable hideaway hood with drip-free collar adjustments. Adjustable elastic waistband with shock cord and dual cord locks.